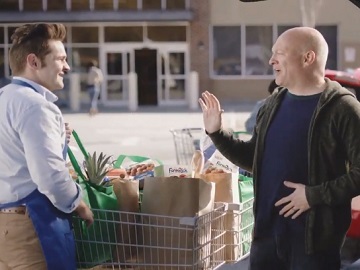 Farm Rich Snacks advertises its products in a hilarious new ad, featuring a husband and father who is clueless when it comes to shopping but knows what it should be served at game time. The spot opens with the man assuring his wife, while getting out of the car, in the parking lot of a grocery store, that he’s not going to forget anything. However, he soon realizes, thanks to her, that he was about to leave the car keys in the car. As he grabs the shopping list and takes a look at the items written down, he already has some questions, such as “what’s the word that starts with the v” (which was “vegetables”). He then mistakes coriander for a Swedish band, asks a cashier that helps him push the car what food group he would put pork rinds it, and says, in reference to the fact that his wife put salsa on that list, that he prefers merengue. “What happened?” his wife asks him when he gets home, but he doesn’t have an answer. “I don’t know, honestly,” he replies, after putting down the shopping bags, filled with Farm Rich products. “There are a lot of questions out there. But what to serve at Game Time shouldn’t be one,” the voiceover says at the end of the commercial, which also features the Farm Rich Breaded Mozzarella Sticks, the Loaded Potato Skins, and the Farm Rich Jalapeño Peppers on screen.